Sergei Filatov, a one-time head of President Boris Yeltsin's administration left politics a long time ago to turn his professional interests to culture, education and literature. From a World War II childhood to a leading role in developing the Constitution, Sergei Filatov's life could almost be a history of 20th-century Russia. The former electromechanical engineer was in the midst of a political career that had started in 1990, with his election to the Congress of People's Deputies in the Russian Soviet Federated Socialist Republic, when he led the working group on the draft Constitution, which was accepted in a national referendum on Dec. 12, 1993. After stints as the head of President Boris Yeltsin's administration and of Yeltsin's re-election committee in 1996, Filatov left politics and turned his professional interests to culture, education and literature. This befits his own family history as his father, World War II veteran Alexander Filatov, was a poet. Sergei Filatov's memoir, which includes some of his father's poetry, was published earlier this year, the centenary of Alexander's birth. “We are living another life, but I decided to put his Soviet verse into the book,” Filatov told The Moscow News. Filatov is very much a child of the war. Born in Moscow in 1936, he was old enough when it started to be able to remember it, and his most vivid memories come from that time. He suffered from a concussion as a boy, incurred during a bombing raid over the city, and his family, like so many at the time, was in poverty - he had to wear clothes handed down from his sisters. Filatov's family was evacuated to the village of Mary during the war. Many people were evacuated, and when they returned, saw that their apartments had been occupied by people who had lost their own homes during the bombing. Suing to get their apartment back, friends sheltered Filatov's family in a flat that was so small, the children had to sleep under the table. Filatov cited this as an example of the trust people had in each other at the time. He feels that today, few would allow such an inconvenience. Sometimes, however, trust could go too far. “We would allow people to stay the night - a mother and a little girl, distant relatives, then we'd wake up in the morning and there would be no watches in the house, they had taken them all in the night,” he said. 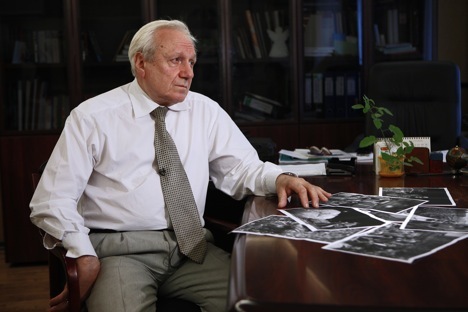 Despite the challenges of his childhood, his education did not suffer, and his graduation from a metallurgical college in 1964 allowed him to begin work at the Serp i Molot (Sickle and Hammer) plant in Moscow. He was an adviser at the Jose Marti Metallurgical Plant in Cuba from 1966 to 1968, then headed the Tselikov Institute of Metallurgical Engineering back in Moscow. Earning his PhD in 1984, Filatov was awarded the State Prize of the U.S.S.R. in 1987 for the development of new technology and equipment for the handling of steel, which are still in use today. Filatov's political career saw a move from Russia's Soviet and post-Soviet legislature to the presidential administration within three years, between 1990 and 1993. His role in the development of the Constitution gives him a unique perspective on constitutionality in today's Russia. Russia's foreign relations, especially with Western countries, give him cause for concern. In a more affirming response to problems in modern Russia, Filatov has headed his Fund for Socio-Economic and Intellectual Programs since 1997, supporting educational and cultural growth among young people. Since 2001, the fund has sponsored the Russian Young Writers' Forum, which this correspondent attended in 2002. “We have been meeting with politicians, of course, but we try to give real and honest information about the state of the modern political system firsthand, not from the TV,” Filatov said. The development of modern Russian literature is the forum's main purpose, providing support for first-time writers through publishing books and anthologies by its participants. In its 13 years, the forum has published 24 books and 40 collections, and the number of applications to attend has more than doubled. Additional projects include seminars held in other former Soviet republics, a literary contest among young writers from Russia's closed cities, and, since 2008, a forum for writers from the North Caucasus. One of Filatov's major successes has been giving young writers the chance for publication in major literary journals, such as Novy Mir. Without the forum's support, chances for publication would be much fewer, and the development of Russia's modern literary culture in the age of television and the Internet would be even slower.